a few elderflower blossoms, which we were using in our pancakes. oh, and those strawberries? from our garden. i've been going a little bit mad around here on the cordial front. it started for me earlier this spring with violets. they were the first flower around here that came in something like abundant quantities. 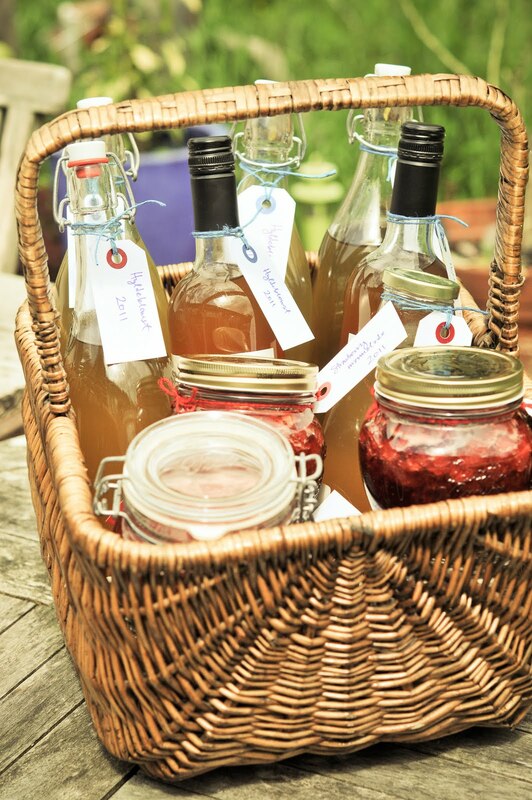 as you can see from the post over on the sustainable life blog, i started with jelly, but soon switched to cordial. my family likes it better - they're not jelly people, it seems (perhaps because the actual violet flowers i put in the violet jelly looked a little bit like flies, but just leave those out). but the violet cordial has been brilliant. i mused a little bit about the actual picking of violets here - it takes an eternity to pick enough, but it's a bit like meditation, and i definitely need that, so i've made 5 batches. you can see that there's not much left in the bottle above, so i suppose i'll be out in the field, meditating again soon. place your violets in a glass or ceramic bowl (don't rinse them, you'll be straining, so it doesn't matter if there are small bugs in with them) and pour two cups of boiling water over them. cover the bowl with a plate and place it somewhere to steep overnight. it will turn a lovely shade of teal, but don't worry, the lemon will fix that. strain the violets - i use a metal strainer lined with a clean tea towel. then add the sugar. stir and place on the stove and begin to slowly heat to boiling. pour in the juice of one lemon and watch the liquid magically turn from teal to brilliant purple. my batches have actually varied in shades of purple as my violets have varied - some days there were more white ones and variegated shades of purple, so some batches have been more purple than others. once it boils, let it boil only for a few minutes and then pour into prepared bottles. i prepare mine by running them through the dishwasher on a hot cycle, pouring boiling water over (for good measure), rinsing with a preservative product called atamon (which i then completely pour out). for several of these batches, i've skipped the atamon because i knew we would use the sirup right away. it would be excellent over ice cream (if one had a freezer - don't ask and don't mention the smeg) or even pancakes. but we use it almost exclusively as a soda. about an inch and a half in the bottom of a glass and the rest filled up with sparkling water (and ice if you have it) and you'll never want to buy regular commercial sodas again. 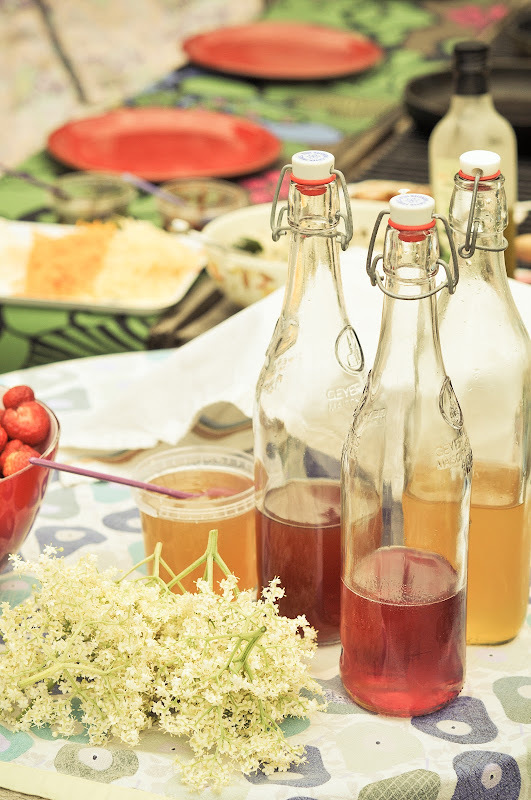 like bee, i've also been making elderflower cordial. yesterday, i counted no less than 21 elderflower trees (they are not bushes around here, no siree) on our property and then husband saw five more down in our forest, which is a couple of kilometers away from our main property. i could practically go into making commercial quantities if i had enough large pots. i make mine the same way i make the violet cordial, by making a "tea" using about 30 of the flowers and hot water first. i used to add the sugar to that water, like bee's recipe suggests, but i had several batches begin to mold on me before i thought they had steeped long enough (the sugar speeds this along, especially if the weather is warm and humid). with the elderflowers, i let them steep for 48 hours, rather than only 24, to get all of the perfumed goodness out of the blossoms. then, i strain them and add sugar in the same quantities recommended by bee. i use 3 teaspoons of citric acid (available in both pharmacies and the grocery stores here) and the juice of four organic lemons as well. i used to use slices of lemons, but now i just juice them and add them to the elderflower "tea" when i boil it with the sugar. these are the best batches i've ever made (and i've been trying now for ten years). i have made batches both with organic sugar and regular white sugar this year and there is a big color difference. regular white sugar gives a gorgeous yellow that will make you think of liquid sunshine. the organic sugar results in a darker, more brownish, honey-colored elixir. i'm not sure which i like best, tho' i lean towards organic on principle. i know tho', that next winter when we break into the golden ones, we'll feel a much-needed direct connection to those long, golden danish summer nights. our elderflowers are still in full bloom and i've got batches 6 and 7 brewing as we "speak." i want to lay in a good supply for the coming months. and last, but not least and not at all a cordial, thanks to the inspiration from chris, one of my partners on sustainable living, i used all of the chive flowers i found around the garden (discovering a load of hidden chive plants i didn't know were there) to make an absolutely beautiful chive vinegar and olive oil. 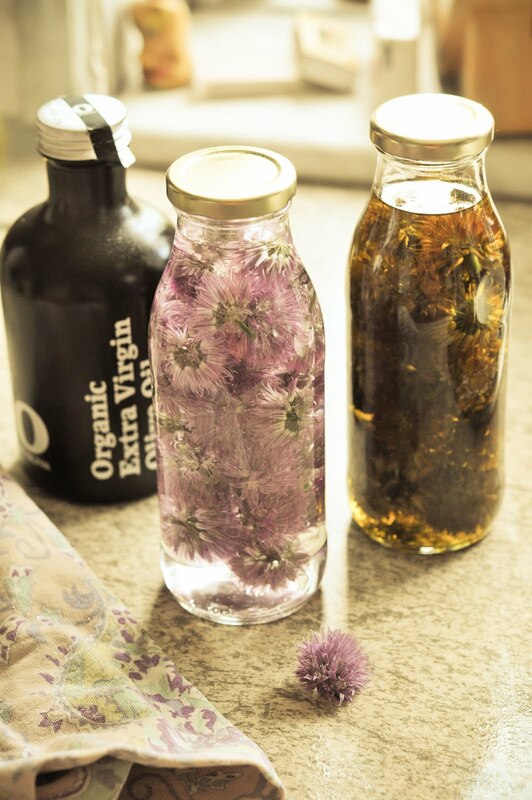 all you do is pick the chive flowers, rinse them very well and pop them into clean bottles (at least half full, but preferably 2/3 if you have enough chives), then fill to the top with good quality white vinegar in one and a good extra virgin olive oil in the other. within a couple of days....instant salad dressing. i have repurposed tomato sauce bottles and they work just great, so there's no need to go out and buy something fancy. and as for the rhubarb + vanilla cordial? i'll do a rhubarb post in the coming days, so stay tuned for that. for more inspiration on what to do with found flowers, check here. sounds delicous - and your photos are stunningly beautiful! This is very educational, J! I had no idea about violet cordial -- and the chive vinegar is such a good idea, too. It also looks beautiful. The only problem is that my chives have just been deadheaded. The flowers were looking decidedly brown and faded. I hope to remember this recipe, though, for the next time they come around. I noticed, on my walk today, that the elderflower has just (suddenly, it seems) disappeared. I'm so bummed that I never got in a second batch. I'm just drinking some now -- and it is SO delicious. Do you have a large pantry? Where are you storing all of this stuff? Elderflower fritter are good too! Dipped in a light tempura batter, shaken and then dropped into hot oil,until lightly golden. Remove and drain well on kitchen paper. Serve with a shake of icing sugar.